In Microsoft Intune, third-party certification authorities (CA) can be added. These CAs can deliver certificates to mobile devices using the Simple Certificate Enrollment Protocol (SCEP). This feature can issue new certificates and renew certificates on Windows, iOS, Android, and macOS devices. There are two parts to using this feature: open-source API, and the Intune administrator tasks. Microsoft created an API that integrates with Intune to validate certificates, send success or failure notifications, and use SSL, specifically SSL socket factory, to communicate with Intune. The API is available on the Intune SCEP API public GitHub repository for you to download, and use in your solutions. Use this API with third-party SCEP servers to run custom challenge validation against Intune before delivering a certificate to a device. 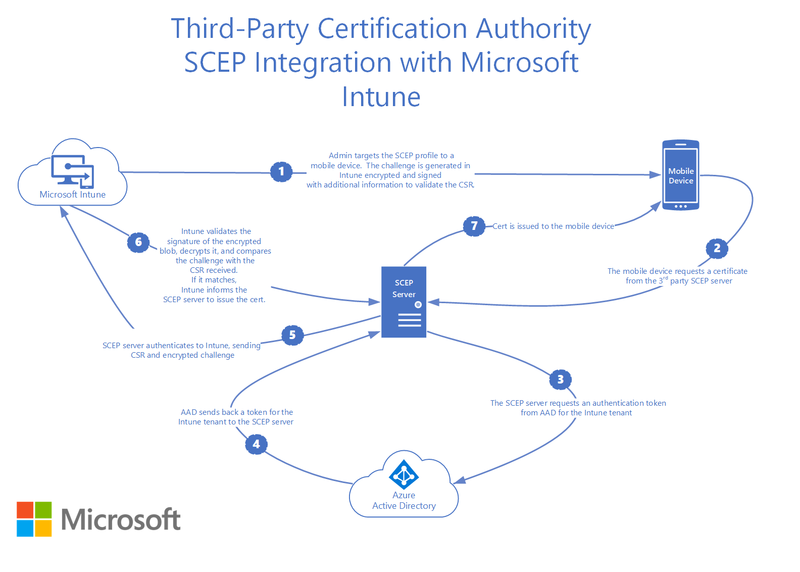 Integrate with Intune SCEP management solution provides more details on using the API, its methods, and testing the solution you build. Using an Azure Active Directory (Azure AD) application, you can delegate rights to Intune to handle SCEP requests coming from devices. The Azure AD application includes application ID and authentication key values that are used within the API solution the developer creates. Administrators can then create and deploy SCEP certificates profiles using Intune. You can also view reports on the deployment status on the devices. This article provides an overview of this feature from an Administrator-perspective, including creating the Azure AD application. In Intune, an administrator creates a SCEP certificate profile, and then targets the profile to users or devices. The device checks in to Intune. Intune creates a unique SCEP challenge. It also adds additional integrity-check information, such as what the expected subject and SAN should be. Intune encrypts and signs both the challenge and integrity-check information, and then sends this information to the device with the SCEP request. The device generates a certificate signing request (CSR) and public/private key pair on the device based on the SCEP certificate profile that's pushed from Intune. The CSR and encrypted/signed challenge are sent to the third-party SCEP server endpoint. The SCEP server sends the CSR and the challenge to Intune. Intune then validates the signature, decrypts the payload, and compares the CSR to the integrity-check information. Intune sends back a response to the SCEP server, and states whether the challenge validation is successful or not. If the challenge is successfully verified, then the SCEP server issues the certificate to the device. Before integrating third-party certification authorities with Intune, confirm that the CA you're using supports Intune. Third-party CA partners (in this article) includes a list. You can also check your certification authority's guidance for more information. The CA may include setup instructions specific to their implementation. To allow a third-party SCEP server to run custom challenge validation with Intune, create an app in Azure AD. This app gives delegated rights to Intune to validate SCEP requests. Be sure you have the required permissions to register an Azure AD app. Required permissions lists the steps. Enter a name and sign-on URL. Select Web app / API for the application type. Integrate applications with Azure Active Directory includes some guidance on creating an app, including tips on the URL and name. In your Azure AD app, open Settings > Required Permissions. Select Add > Select an API > select Microsoft Intune API > Select. In Select permissions, choose SCEP challenge validation > Select. In Azure AD, select your new application (App registrations). Copy the Application ID, and store it in your application code. Next generate an authentication key. In your Azure AD app, open Settings > Keys. In Passwords, enter a description, and choose the duration of the key. Save your changes. Copy and save the value shown. Copy and save this key immediately, as it's not shown again. This key value is needed with your third-party CA implementation. Be sure to review their guidance on how they want the Application ID, Authentication Key, and Tenant ID configured. The Tenant ID is the domain text after the @ sign in your account. For example, if your account is admin@name.onmicrosoft.com, then your tenant ID is name.onmicrosoft.com. Get application ID and authentication key lists the steps to get these values, and provides more details on Azure AD apps. As the administrator, create a SCEP certificate profile to target to users or devices. Then, assign the profile. When you unenroll or wipe the device, the certificates are removed. The certificates aren't revoked.